Most guys of my age and my physical “stature” likely spend their sunny Sunday afternoons on a golf course. Or sitting in a baseball park or at a movie theater. Maybe they just spend the afternoon on the couch, recovering from a long week and preparing for a longer one. Instead, I spent my last Sunday at a civic center in Central New Jersey. I was there to cheer on my daughter, competing in her first “Challenge of Champions,” a regional grappling and kickboxing tournament sponsored by Tiger Schulmann’s MMA. My mini-me has been training with Tiger Schulmann’s for two years now. 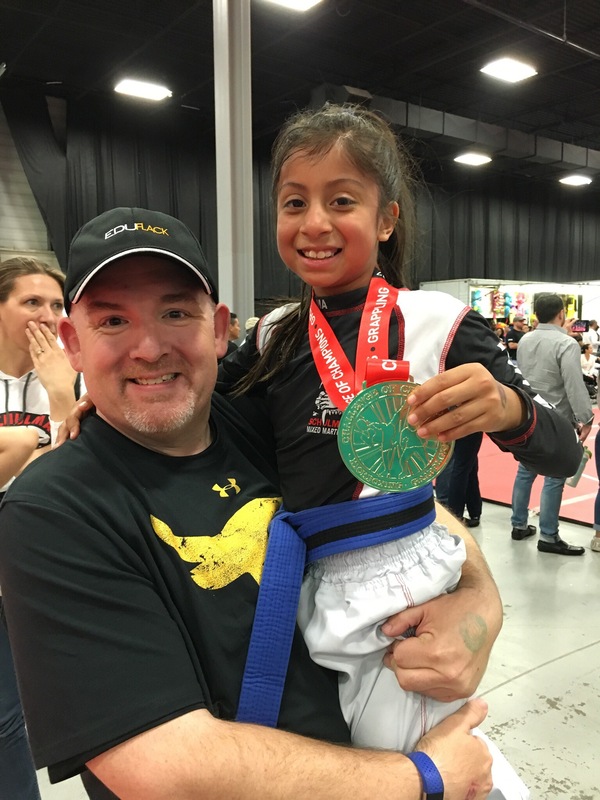 On Sunday, she earned a silver in grappling for 9-10-year old girls, and a gold for kickboxing. But I was also there for me. I’ve been training a few months longer than my daughter. As a result, I spent my Sunday strapping on my gear to kickbox against the old, fat, and unskilled bracket (those over 40, more than 200 pounds, and with white, blue, or yellow belts). Unlike my daughter, I left with no celebratory hardware. Instead, I walked away from my bouts with two fractured ribs, bones broken 30 seconds into my first fight, and that remained broken throughout my entire second bout. Which begs the question, why in the world is a guy like me spending his Sunday getting kicked and punched to the point of breaking? Why do I spend much of my free time sparring with men half my age and with (at least) twice the skills and athletic prowess? Why do I suffer from broken toes, fractured tibia, and more bruises than I care to count, and respond by thinking of how I can do better and how I can avoid suffering the same injuries in the future? I should be pedaling a stationary bike or strolling around the neighborhood. Instead, I worry about the quickness of my left cross and the strength of my roundkicks. I do it because it forces me to do something that doesn’t come easy to me. Not everything should come naturally. Not everything is covered by our personal skill sets or lives in our personal wheel houses. When we are challenged to break those comfort zones, we learn who we truly are as individuals. I do it because it eliminates the word quit from my vocabulary. Parents know how often kids want to stop doing something because it might be a little challenging. If I’m not traveling for work, then I’m on the mat training. I don’t come up with excuses to skip, and my kids (both of whom train) similarly can’t offer excuses. I do it to be healthier. Yes, kickboxing is an incredible workout. I’m a man who once weighed more than 400 pounds. Today, I am in the best physical shape of my life. I’m stronger. I have far greater physical stamina. More importantly, I am healthier so my kids see the importance of a healthy lifestyle and staying physically active. If dad (and mom) can do it, then the kiddos can definitely do it. I do it to clear my mind. It may sound silly, but the hour on the mat is the one hour in a given day when I don’t think about work or family or finances or any of the other thousand and one things that weigh on me most days. I need to focus on the task at hand. If my mind drifts to a work issue, I’ll take a blow to the body (or worse, to the head). So I need to stay focused on me and my opponent. All of those professionals who embrace the philosophy of “deep thinking” or who bemoan the impact of multi-tasking fully understand the benefit. I do it because it is a pure meritocracy. No one cares what one does for a living. It doesn’t matter how much money one earns, how big one’s house is, or what car one drives. What matters is commitment, focus, and skill. It’s about the color belt around one’s waist and the number of days one trains. As a result, my community is one that we strive for in the 21st century. It is male and female. It is black, white, brown, and yellow. It is Christian and Jewish, Muslim and atheist. It is young and old. At the end of training, we are all just brothers and sisters, working toward similar goals. And I do it because it provides a sense of family. It may sound incredibly corny, but our little Princeton school does indeed become a family. I care for many of the other kids there as I do for my own, watching them train and develop. We have a tight group of families that train, with both parents and all kids working. It provides a sense of belonging that it harder and harder to find these days. We help each other through training issues, through work issues, through family issues, and through personal issues. And we do it because we choose to, not because of a sense of obligation. I have no grand aspirations. I recognize that Dana White is never going to come knocking on my door, because he has been looking for someone just like me to join the UFC. I know that, no matter how much time I put in, my skills will never be great. Sure, I know they will improve over time, and I want them to improve, but few will ever look at me and use the words “skilled fighter” without adding a “not a” before it. I’ll continue to work through the bumps and bruises and breaks, using them as motivation instead of reason for surrender. I do so because it makes me a better, more complete individual and because it makes us a stronger, more capable family. I’m reminded of that when I see a group of people cheering their hearts out for my daughter as she took home the gold. I’m reminded of that when I see those members of my Tiger family who waited until the very last fights of our friends were fought late on Sunday evening. And I’m reminded of that when I see the resiliency, commitment, and respect my young children demonstrate on a daily basis because of it all. At the end of the day, I am a writer, a father, an advocate, an agitator, a strategist, an innovator, and a fighter. And through all of the ups and downs all of those identifiers bring me in both my personal and professional lives, I wouldn’t want it any other way. ← Can We Check Our Impulse to Condemn? Great article and words to live by. Never quit and keep challenging yourself. It really is the only way we grow as humans. I wish you the best on your journey. I also agree Tiger Schulmann is a fantastic institution with great leaders. Trump’s EduBudget … Not Again!